The Distillery is an awesome lunch spot on the canal. Hardly anyone seems to know about it either, which, on a selfish level, makes my inner only child quite happy. My love for The Distillery started when we found it one sunny afternoon, after moaning about where I live. I don’t really like residing in Tyseley for several reasons: it’s seriously lacking in entertainment, Deliveroo doesn’t deliver Lebanese food at 10am here, and my next door neighbours are basically a 2018 version of the Nesbitt’s with all the charm of a tin of spam. However, one of the few things I am grateful to this hell-hole of an area for (aside from the cheap rent) is its proximity to the canal. Just a 5 minute walk from my house there’s a cut through that allows me to nip onto the winding canal paths that lead all the way to the city centre. Gone are the cars and echos of local kids screaming and found is some quiet above the noise and greenery… minus the occasional bit of ‘screw da po po’ graffiti. Aside from some old blokes fishing alone in silence and the occasional Lycra-clad runner pounding the pathways it’s also quite possible to walk for miles without seeing another soul. Which when you have a job that involves talking to people a lot is often a blessing. With the lovely spring weather in full swing last weekend, Ian (exactly a year since moonlighting as a ‘Liam Gallagher wannabe’ – Birmingham Mail, June 2017) and I headed out for a long walk. 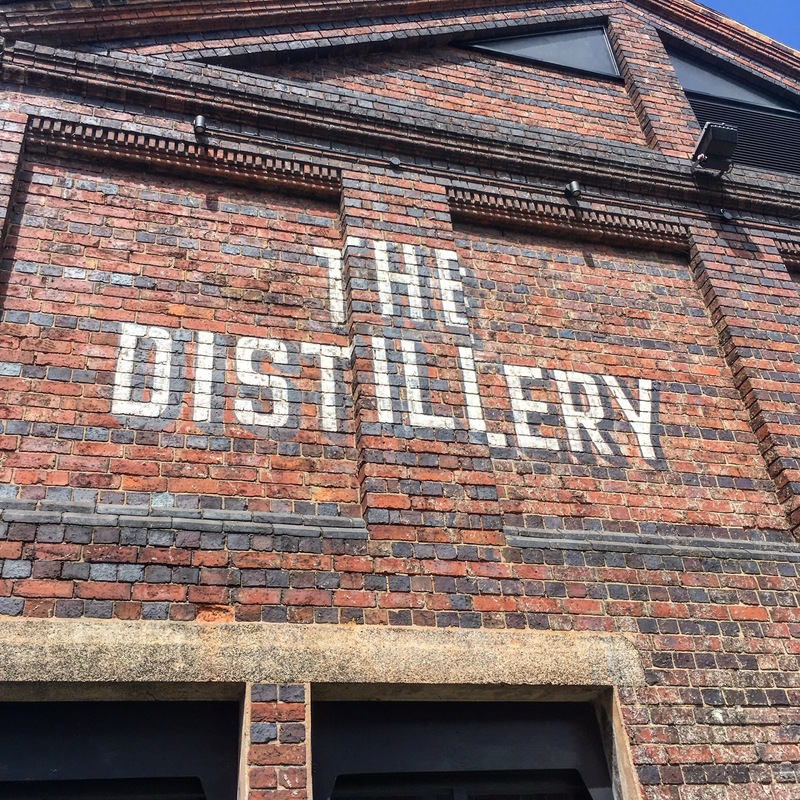 Being that my husband refuses to walk anywhere unless there’s a pint at the end of it, and I will walk for hours just to eat something tasty, before setting out we agreed our destination: The Distillery. A near on 10km walk from our house, we’ve been to this canal-side joint several times. 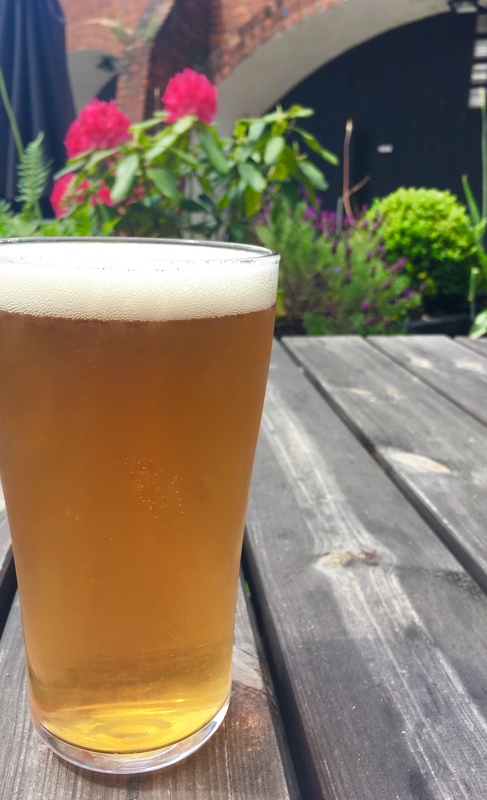 My other half – who runs home along the canals most evenings like a Daddy Longlegs on speed – came across it and, knowing what I like in a summertime pub (big beer gardens, good beers, copious amounts of food), suggested we try it out. We’ve returned many times since, for good reason. It’s a gorgeous place inside and out and, much to my delight, the beer garden was only a third full on a hot day. (The latter is not a negative and I enjoy not wrestling the smokers for a seat). The exposed brick work is beautiful and the bar is massive, with bar staff are all welcoming and chatty. I took a good look at the extensive gin menu (great choices including Pinkstar, Aviation, Tanqueray no. 10) as well as the cocktail options, but due to the heat, and my inability to say no to lager, I ordered a pint of Lawless. There was a really decent selection of draft beers and lagers actually, although not the cheapest. We got settled on a sun-drenched table near the bar, and admired the setting. From where I was sitting I had a view of the canal and the far reaching tables, as well as an array of flowerbeds; the garden area is kept immaculately clean and well presented. There’s also a very large screen that’s just been fitted for the World Cup. Many people around us were eating, and the food looked glorious – special shout out to the chap smashing in a huge roast lamb dinner whilst sweating buckets. Heroic effort; don’t let sunstroke stop you having gravy, lad. 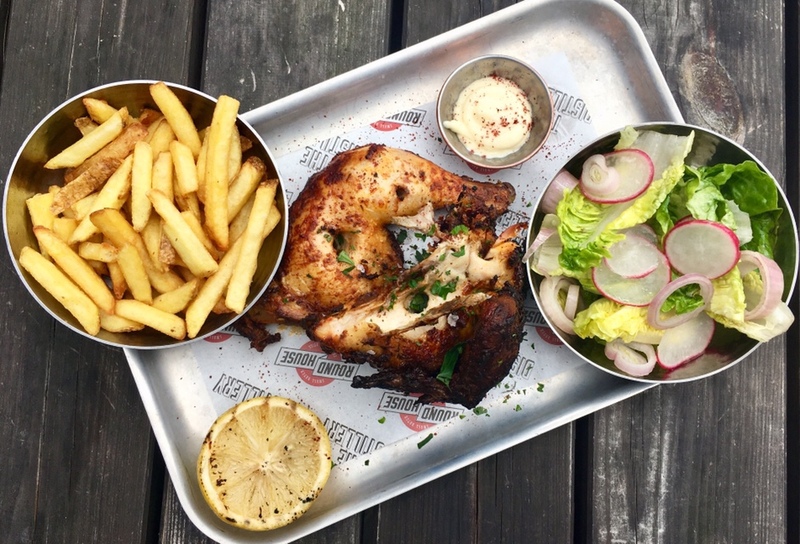 After debating what to order, I decided on the Garlic & Paprika Rotisserie Chicken (£11) which came with fries, garlic aioli and a lettuce, mint and radish salad, and for Ian the Lamb Shawarma (£12.50). The food was delivered quickly and both dishes looked fantastic; generous portions which is always welcome. The half chicken was still on the bone meaning I got to rip it apart like the aggro carnivore I am, and the meat was tender and flavoursome. The garlic infused skin was also crispy and savoury, making me think it had been basted in a flavoured oil before and during cooking. Either way it was ruddy delicious and I happily ate morsels of the zingy meat alone or plunged into the creamy dip. Great fries too; decent portion, crispy, freshly fried and well seasoned. 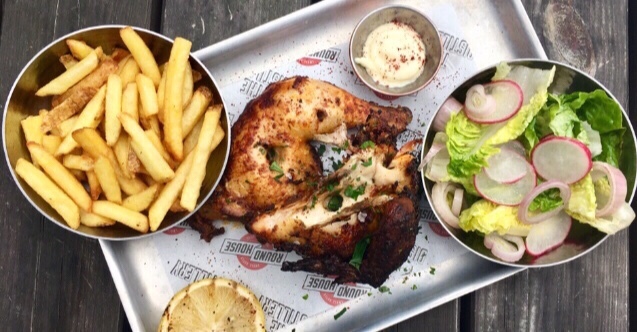 The side salad was small but provided some nice freshness to cut through the well basted chicken. My only gripe would be that the wing was charred beyond recognition, but Ian still gave it a good home. 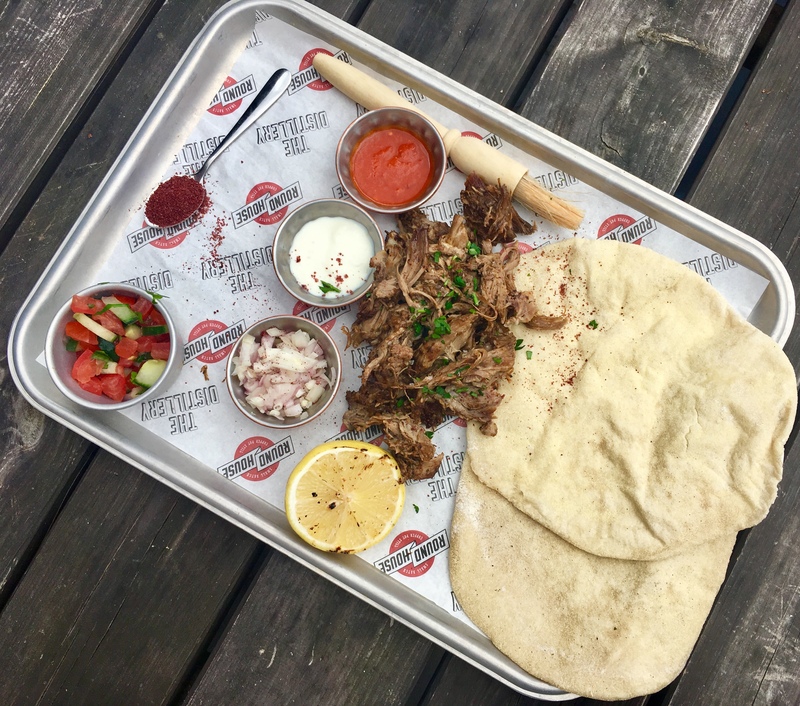 The fork tender lamb was flavourful with notes of cumin, nutmeg, garlic, and the build your own platter was colourful with an array of sauces. The additional teaspoon piled high with sumac is a nice added touch. Two warm flatbreads take up the majority of the tin tray, ready to be the casing for the gently spiced lamb. 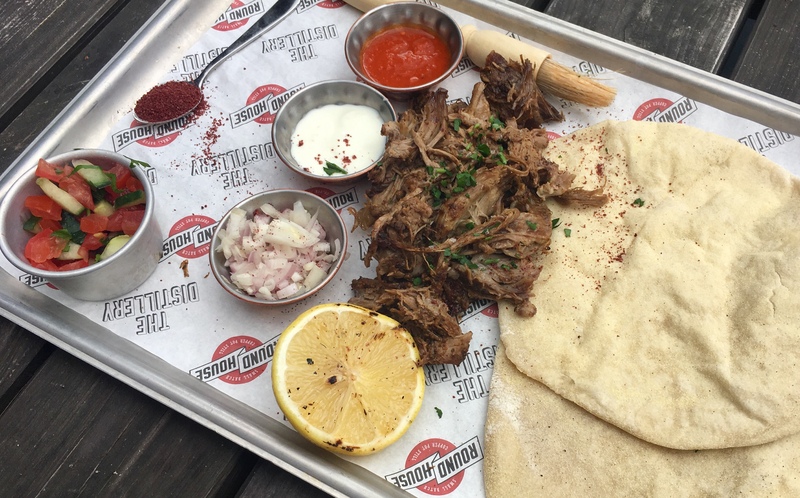 There’s something quite satisfying about making the shawarmas, and you can adapt the fillings and heat to suit your tastes. Two thumbs up from the big man on this, and I’m told it was better than the pork and chorizo burger he had last time. 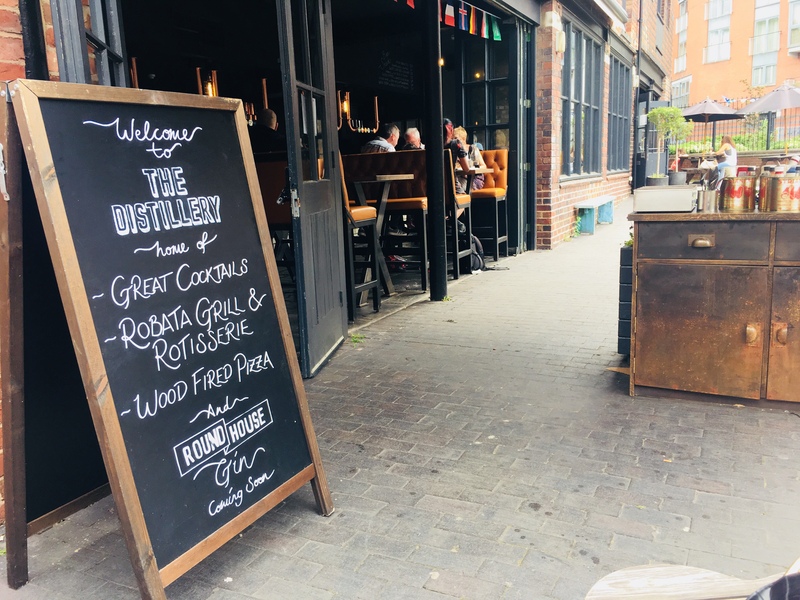 The Distillery is a lovely city centre find that’s both cool and homely; somewhere you could take your mum for a nice Sunday lunch or have a cheeky double Hendricks (or 5) with friends. The added (non negotiable) 12.5% food service charge seems a bit unfair, being that you order at the bar and only see your server once, but considering the quality of the food and venue I didn’t mind paying it really. 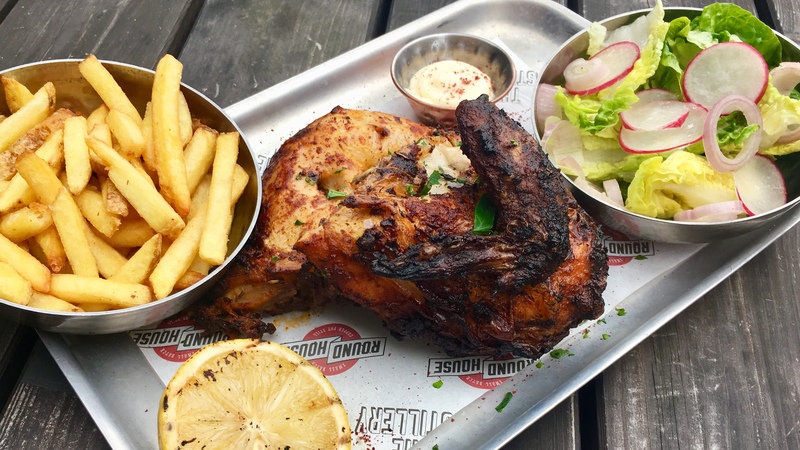 I want to try the roast dinners for sure, and I’m most definitely heading back for some more of that dribble-inducing chicken. 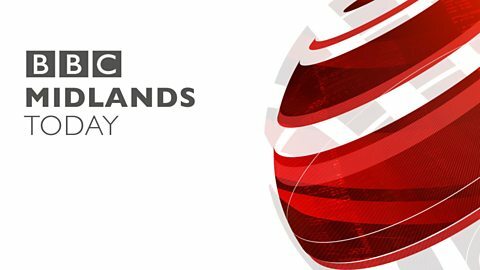 What’s more it’s literally a 5 minute walk from Brindleyplace, making it more accessible than people probably think. Have you eaten at here before? Do you rate the food? Let me know in the comments.